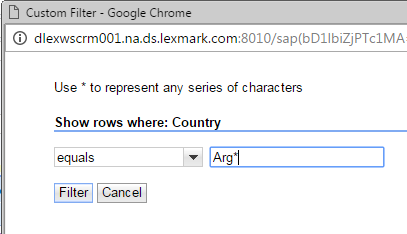 Filtering a list output is a very frequent requirement in SAP. 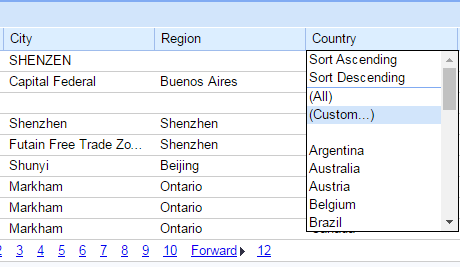 SAP CRM Web UI table views provide filtering without any coding. The framework takes care of that. 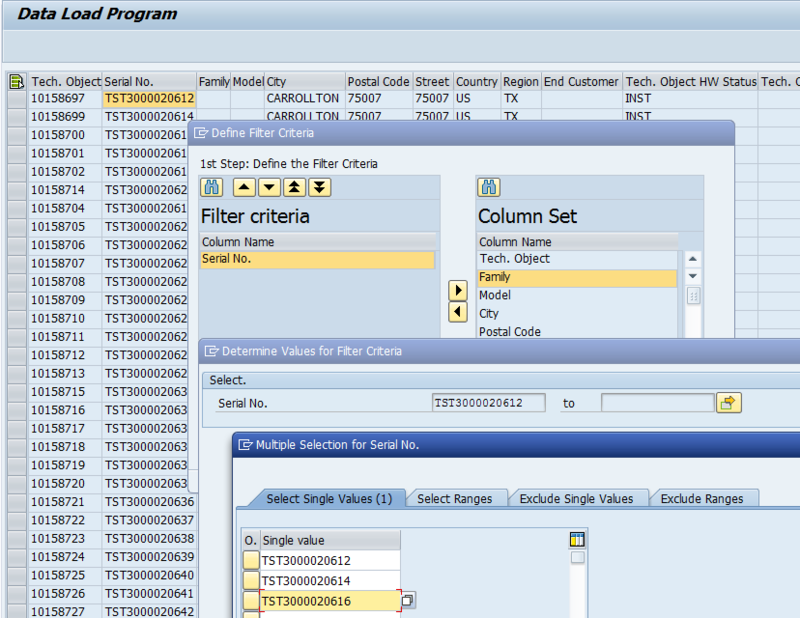 Users can click on the column header to get a Context Menu where they can choose any of the filter values. Users can also select Custom and provide a wild card based filtering. Althoug there is one limitation. Users can’t filter for multiple values of one column. The table view has a button “Filter” on clicking whcih a popup comes up where user can select the field on which they want to apply filter. They have a “+” icon to add more filter criteria. The view has a similar look and feel as that of a search view. This step is required to create the popup. Since the popup is basically a search view, we need a Dynamic Query Object to implement the same. Go to Transaction SE24 and create an Implmentation Class of the Custom Component. Give superclass as CL_WCF_GENIL_ABSTR_COMPONENT. Go to Transaction SM34 and open View Cluster CRMVC_GIL_APPDEF. Define the custom Component and assign the implementation class. Give any suitable name and provide the structure of the table view as the key structure, attribute structure and create structure. 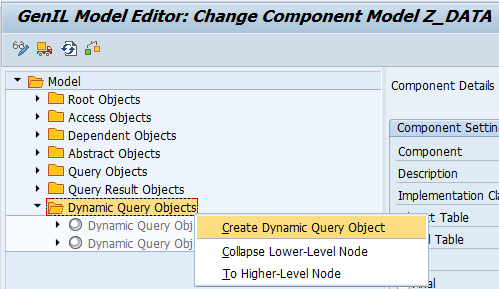 Right Click on the Dynamic Query Objects and select Create Dynamic Query Object. Give any suitable name and provide the structure of the table view as the attribute structure. Mention the root object created earlier as the Root Object and Result Object. Assign the Component Set created in Step 1 as Model in the Runtime Repository. Create an empty view with one model node corresponding to the BOL Entity defined earlier as Dynamic Query Object. 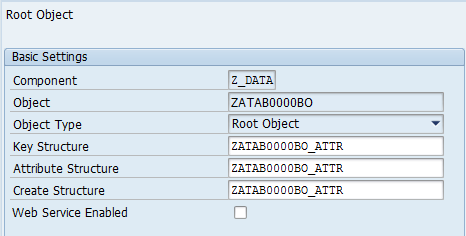 Define attribute VALUE_HELP_TABLE of type BSP_WD_DROPDOWN_TABLE in the context node implementation class. Go to the superclass of the implementation class of the view and change the superclass of that to CL_BSP_WD_ADVSEARCH_CONTROLLER. Go to the implementation class of the context node and change the superclass to CL_BSP_WD_CONTEXT_NODE_ASP. <thtmlb:areaFrameHeader title                 = "Select Filter Critetria"
fieldMetadata     = "<%= controller->GET_DQUERY_DEFINITIONS( ) %>"
header            = "<%= ZATAB0000BO->get_param_struct_name( ) %>"
fieldNames        = "<%= controller->GET_POSSIBLE_FIELDS( ) %>"
Create a configurationfor the view and select the fields that you want to allow the users to filter on. Create two event handlers CLEAR and FILTER. Add the following code to read the filter criteria and navigate back to the previous screen. lo_col           TYPE REF TO if_bol_bo_col. lr_window->call_outbound_plug( iv_outbound_plug = 'FILTER' iv_data_collection = lo_col ). Add the following code to clear the filter criteria and navigate back to the previous screen. lr_qs        TYPE REF TO cl_crm_bol_dquery_service. Define context node in the component controller with the same BOL entity as that of the table view context node. This is required for the dropdown in the filter popup. lr_entity   TYPE REF TO if_bol_bo_property_access. lt_fields TYPE STANDARD TABLE OF dfies. LOOP AT lt_fields INTO ls_fields. SORT lt_table BY key value. DELETE ADJACENT DUPLICATES FROM lt_table COMPARING ALL FIELDS. DATA: lr_dd TYPE REF TO cl_crm_uiu_ddlb. ls_tab  LIKE LINE OF lt_tab. LOOP AT value_help_table INTO lwa_val WHERE key = COMPONENT. APPEND INITIAL LINE TO lt_tab. lr_dd->set_selection_table( it_selection_table = lt_tab ). 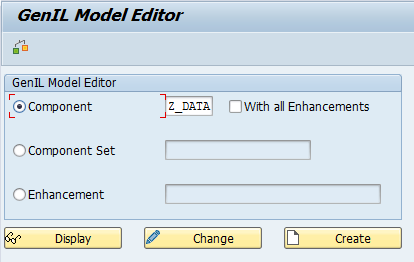 Create a window and add the context node for the same BOL Entity. Bind the view context node with window context node. Create an inbound plug DEFAULT and an outbound plug FILTER. Add the following code in the inbound plug method. This method is implemented to populate the filter criteria set earlier in the session i.e. say user selects some filter criteria and filters the list and then again goes back to the pop up to select/deselect some filters then the previous filter criteria is set using this method. lr_entity        TYPE REF TO if_bol_bo_property_access. IF iv_collection IS BOUND AND iv_collection->size( ) > 0. Add the following code to the outbound plug, to navigate away from the view and close the popup. fire_outbound_plug( iv_outbound_plug = 'FILTER' iv_data_collection = iv_data_collection ). Define context node in the component controller with the same BOL entity as that of the table view context node. Bind this context node with the corresponding context node in the view. 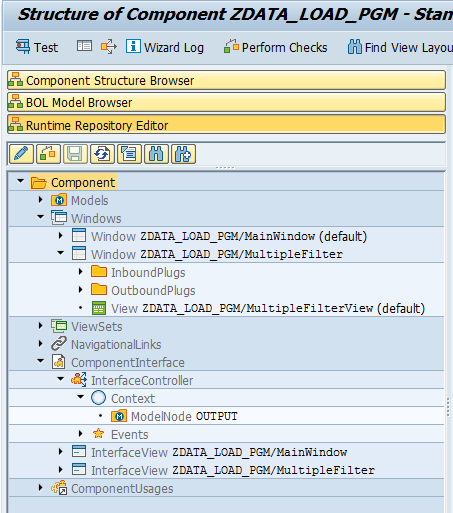 Assign the view to the window and add the window as an interface view in the runtime repository. 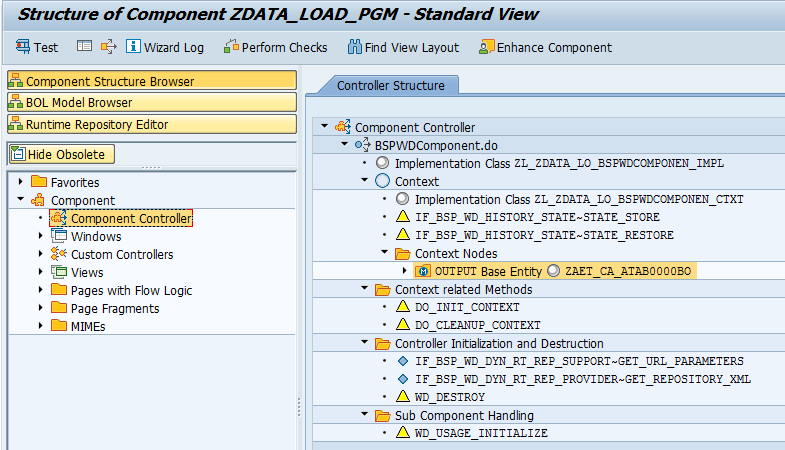 Redefine the method WD_USAGE_INITIALIZE of the component controller of the table view component. 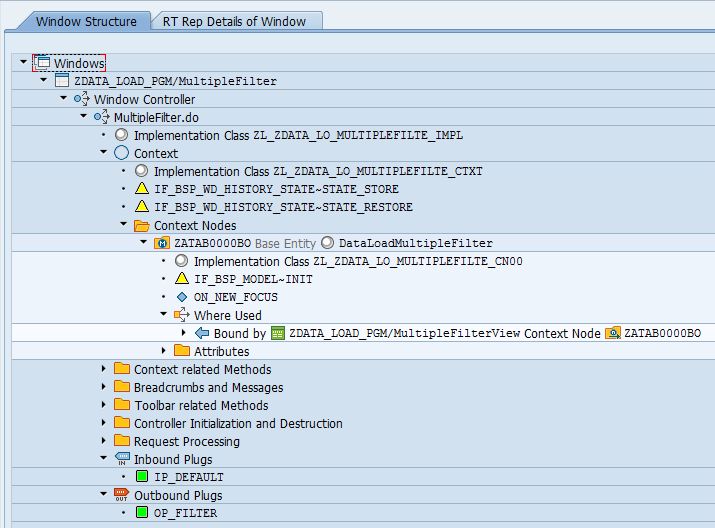 Define attribute FILTER_POPUP type ref to IF_BSP_WD_POPUP in the table view implementation class. Define attribute GO_FILTER type ref to IF_BOL_BO_COL in the table view implementaion class to hold the filter criteria. 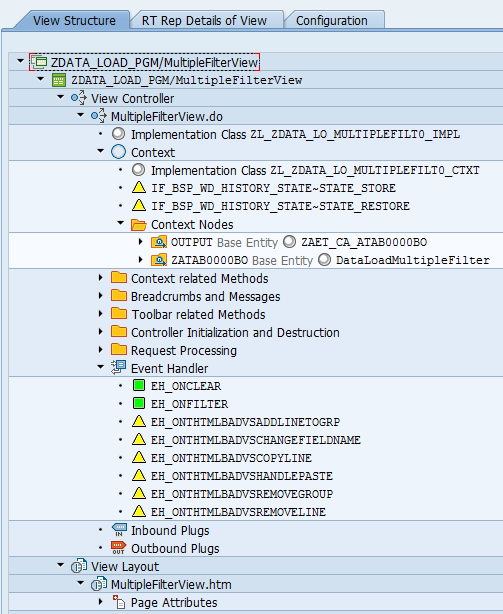 Go to the table view and redefine the method IF_BSP_WD_DYN_BTN_CONTROL~GET_BUTTONS and add the following code. The button is enabled if the table view has entries in it. IF me->typed_context->zatab0000bo->collection_wrapper->if_bol_bo_col~size( ) > 0.
lr_comp_controller TYPE REF TO zacl_class0000b9_impl. IF filter_popup IS NOT BOUND. iv_title = 'Set Filter' ). filter_popup->set_on_close_event( iv_view = me iv_event_name = 'SET_FILTER_CLOSE' ). filter_popup->open( iv_collection = go_filter iv_inbound_plug = 'DEFAULT' ). lr_filter       TYPE REF TO if_bol_bo_property_access. lt_attr   TYPE STANDARD TABLE OF ty_attr. IF lo_col->size( ) > 0. SORT lt_filter BY attr val. 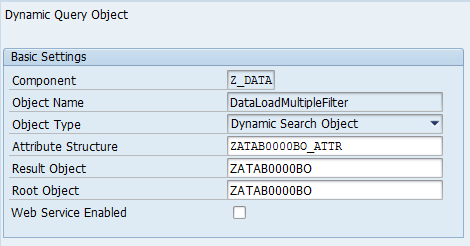 DELETE ADJACENT DUPLICATES FROM lt_filter. DELETE ADJACENT DUPLICATES FROM lt_attr. LOOP AT lt_attr INTO ls_attr. LOOP AT lt_filter INTO ls_filter WHERE attr = ls_attr-attr. Very useful and wonderful…keep it up..Sayan..